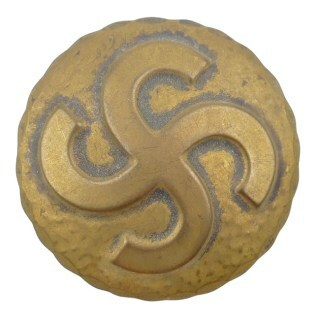 Dutch 'WA / SS' Wolf-Hook Pin (Wolfsangel speld). The complete pin is approximately 40mm long and the wolfhook is fairly large with a size of 20mm. Nice and decorative original sympathy pin in good condition! 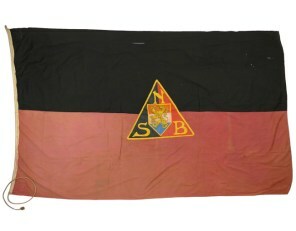 NSB flag - (Vlag der Beweging). The NSB was the Dutch National Socialist Movement. The large sized flag is approximately sized 215x128 cms, I've never seen one in this large size before. NSB flags are hard to find nowadays. Nice original example in good used condition! 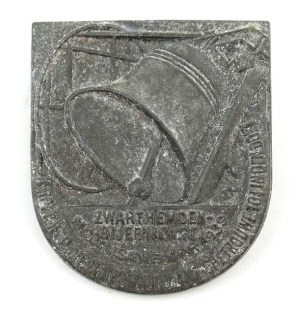 'Nederlandsche Arbeidsdienst' (Dutch labour service) miniature sports medal. 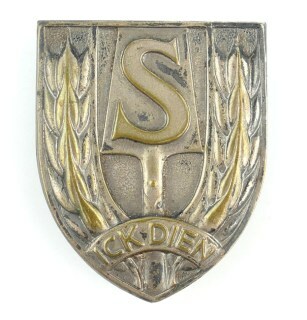 The miniature medal shows the NAD motto: 'Ick Dien' (I serve) and a spade with a capital 'S' (signifying 'sport'). Complete with original ribbon. Nice original example! 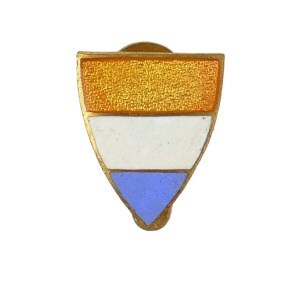 NSB/Dutch-SS Sympathy Pin in "Oranje-Blanje-Bleu" (in the colors of the old Dutch Princevlag). Complete with buttonhole attachment. The pin shows some normal scratches and traces of usage and is in overall good used condition. Nice and hard to find original example! Ribbon for the NSB 'Oostlandkruis', also known as 'Mussert Kruis' (Mussert Cross). Perfect for completing your Mussert Cross, hard to find when needed. Nice original ribbon! NSB 'Oostlandkruis', also known as 'Mussert Kruis' (Mussert Cross). Complete with its original confectioned ribbon. There is some enamel damage to the obverse, see photos. Nice and scarce original medal in good used condition! NSB Group Leader's Document Grouping named to 'J.Wierema' who was the group leader of the city of Uithuizen. 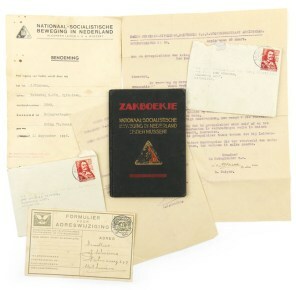 The grouping is consisting his 5 year NSB Membership booklet (Zakboekje) and several other interesting documents. Rare grouping from one person! 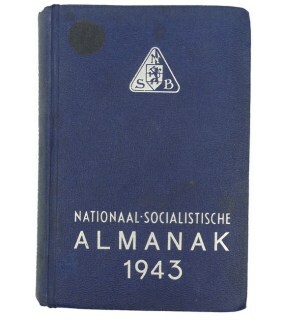 NSB 'Almanak' 1943, the almanac is an annual publication that includes all kind of general and NSB related information. Issue for 1943. Nice original example in good used condition! Framed hand knotted NSB Tapestry, this tapestry hung on the wall in the office of the mayor of Rotterdam during the war. The tapestry is showing the NSB logo, the framed tapestry is approximately sized 65 x 61 cms. Rare and decorative original item! Dutch 'Wachtman' Visor Cap. Nice dark-green coloured woolen visor cap as intended for Dutch volunteers serving as 'Wachtman' in German service. Regrettably without insignia. Scarce original cap in good used condition, not often offered for sale! 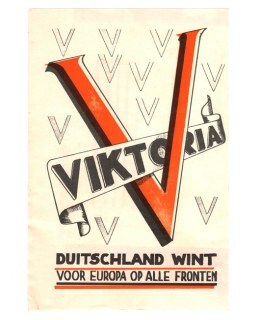 NSB 'V' Action Propaganda Pamphlet 'Viktoria, Duitschland wint voor Europa op alle fronten' (22,5 x 15 cms). The 'V' was used by the Dutch Resistance for Victory, the Germans were smart and turned it into a NSB activity were it became V = 'Viktorie - Duitschland Wint' (Germany wins). Nice pamphlet! 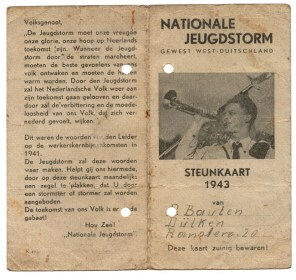 NJS - Nationale Jeugdstorm Steunkaart 1943 (Contribution Card), intended for NJS members living in Germany. This card was issued to a member living in the city of Dülken. 3 stamps have been pasted on. Very rare and hard to find original contribution card! 'L&M' Membership Badge (Landbouw en Maatschappij). The party was NSB loyal, 'L&M' members were recommended to vote for the NSB. Nice hard to find badge in good condition! NSB 5-years Membership Badge (NSB vijf jaren Draagteken). The NSB was a Dutch pro-German Nazi Party. The badge is not visible maker marked, the badge is numbered with the individual number '2413'. Nice original badge in good used condition! NSB - WA Prize Ribbon, this was the 2nd price for some kind of competition/match. A WA cap-badge is glued on the 23 x 7,5 cms sized red and black coloured ribbon. Decorative prize ribbon in used condition! NSB - WA Membership Badge (WA-draagteken). The badge has the colours of the 'Princevlag' and was introduced by 'Van Geelkerken' in june 1938', these badges are only used for a very short period of time and are almost impossible to find! 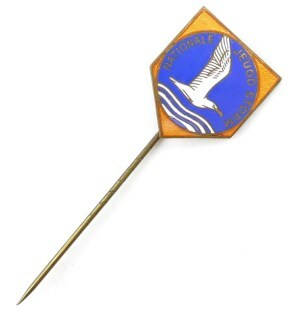 NJS - Jeugdstorm Members Pin (NJS Draagteken). This is the harder to find first model membership pin, also called 'Oud Model' (old model). Scarce original example in good condition! 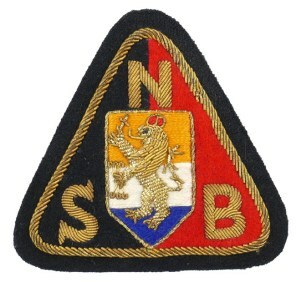 NSB - WA Membership Badge (WA-draagteken). 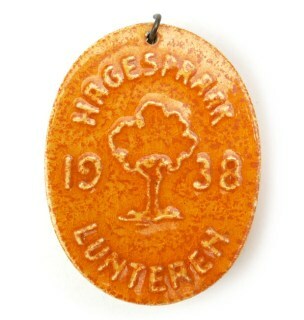 This badge was worn by the members of the 'NSB'-related: 'Weerafdelingen' (being more or less the equivalent of the German SA or 'Sturmabteilungen'). Complete with buttonhole attachment. Nice original example in very good condition! 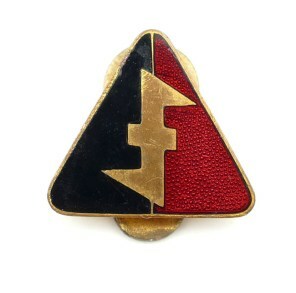 National Socialist Women's Organization (NSVO) 'Het hartvuur heilig - Het haardvuur veilig' Badge (Draagteken). The badge is not visible maker marked. The badge is having a functional pin/catch system. Nice original badge in very good condition! NSB 5-years Membership Badge (NSB vijf jaren Draagteken). The NSB was a Dutch pro-German Nazi Party. The badge is not visible maker marked, the badge is numbered with the individual number '1074'. Nice original badge in very good condition! 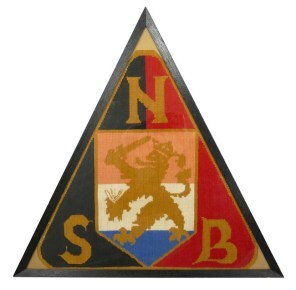 NSB Membership Badge (NSB Draagteken). The NSB was the Dutch pro-German Nazi Party. The badge is having a functional pin/catch system. The pin shows some normal scratches and traces of usage and is in overall good used condition. Nice original NSB Member Pin! NSB 'Landdag Amsterdam' Tinnie. This event was held at 28 April 1934 in Amsterdam. The tinnie comes on its functional pin/catch system, the tinnie is not visible maker marked. Rare original early NSB tinnie in very good condition! NSB '3e Algemeene Landdag Amsterdam' Tinnie. This event was held at 30 March 1935 in Amsterdam. The tinnie comes on its functional pin/catch system, the tinnie is not visible maker marked. Nice original early NSB tinnie in very good condition! NSB '4e Algem. Landdag Den Haag' Tinnie. This event was held at 5 October 1935 in Den Haag. The tinnie comes on its functional pin/catch system, the tinnie is not visible maker marked. Nice original early NSB tinnie in very good condition! NSB 'Hagespraak 1936' Tinnie. This event was held at 1 June 1936 in Lunteren. The tinnie comes on its functional pin/catch system, the tinnie is not visible maker marked. Nice original early NSB tinnie in good used condition! NSB 'Hagespraak 1937' Tinnie. This event was held at 17 May 1937 in Lunteren. The tinnie comes on its functional pin/catch system, the tinnie is not visible maker marked. Nice original NSB tinnie in good used condition! NSB '4e Hagespraak 1939' Tinnie. This event was held at 6 June 1938 in Lunteren. The lightweight aluminum tinnie comes on its functional pin/catch system, the tinnie is not visible maker marked. Nice original NSB tinnie in very good condition! NSB 'Zwarthemden Bijeenkomst' Tinnie. This event was held in the mobilisation year 1939. The tinnie comes on its functional pin/catch system, the tinnie is not visible maker marked. Nice example in good used condition! NSB '5e Hagespraak 1940' Tinnie. This event was held at 12 June 1940. The tinnie comes on its functional pin/catch system, the tinnie is not visible maker marked. There is some oxidation, priced accordingly! Dutch NSB Women's Brooch (Nederlandsche Heemkunst Broche). The brooch has a functional pin-back device to its hollow-back reverse. The brooch is not visible maker marked. Great looking brooch in very good condition! 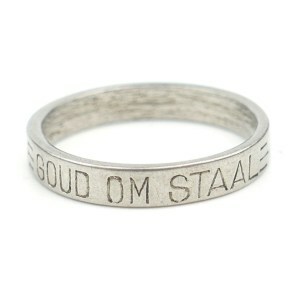 NSB 'Goud om Staal = NSB 1940' Ring. In order to raise funds for the party, the NSB launched the "gold for steel" campaign in January 1940. Members were able to hand in precious metals for which they received a steel ring with inscription as a thank you. Nice original ring! NSB 'Distinctieven der Beweging' Booklet (NSB Lidmaatschapsboekje). The NSB was the Dutch pro-German Nazi Party. This membership booklet is in used condition and belonged to a member in the city of Heerlen. Hard to find issued NSB membership booklet in good condition! Dutch 'WHN' (Winterhulp Nederland) Collecting Box (Collectebus). The colleting-box shows an embossed WHN logo. The collecting box has been repainted. Nice decorative example in good used condition! Very nice NSB (Dutch pro-German Nazi Party) 'Jaarlijksche Afstandsmarsch' Medal. There is a small chip to the enamel, the medal is regrettably missing it's ribbon. Hard to find original medal in good condition! NSB table-medal (or plaque) 'Lotsverbondenheid 10-14 mei 1940'. The medal has a diameter of 4 cms. Nice original NSB table-medal in good used condition! 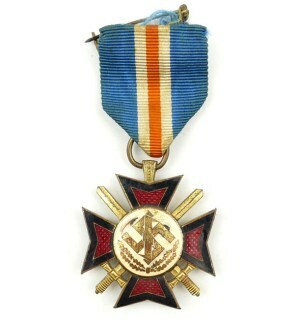 Dutch NSKK Volunteer's Loyalty Honour Badge (Insigne van Trouw). Bronze example which regrettably has been polished once. This badge is in my opinion having a replaced pin and catch assembly. Nice badge in good used condition! 'Nederlandsche Arbeidsdienst' (Dutch labour service) Sports Badge (NAD Sportinsigne). Nice original silvered tombak badge, complete with original lugs on the back. Hard to find exemple in good used condition! 'Jeugdstorm' Bike Pennant (NJS Fietsvaantje). 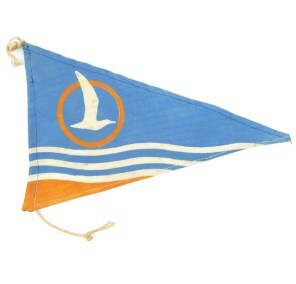 The pennant is made of printed cotton showing the NJS Gull logo. The pennant is complete with original rope. Nice and decorative original NJS pennant in very good condition! NSB '5e Hagespraak 1940' Tinnie. This event was held at 12 June 1940. The tinnie comes on its functional pin/catch system, the tinnie is not visible maker marked. Very nice looking example with great finish, hard to find in this condition! NSB '4e Algem. Landdag Den Haag' Tinnie. This event was held at 5 October 1935 in Den Haag. The tinnie comes on its functional pin/catch system, the tinnie is not visible maker marked. Nice original early NSB tinnie in good used condition! 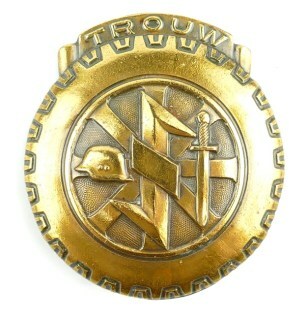 Dutch NSKK Volunteer's Loyalty Honour Badge (Insigne van Trouw). Bronze example which regrettably has been polished once. Complete with often missing original pin and catch assembly. Rare original badge in good condition!